In this program we will find the Root cause of your cognitive decline through blood testing, genetic testing, as well as other diagnostic testing that I run in the office. This will help identify what is needed to reverse and prevent even more cognitive decline. There have been hundreds of patients of Dr. Bredesen’s that have seen success in the reversal of cognitive decline. I am here to coach you through the program ensuring you have the support necessary to succeed. Disclaimer: I do not diagnose cognitive decline, commonly known as “dementia” or “Alzheimer’s.” I coach people through the program to ensure success. Please view the latest links on my blogs posts below to find out the latest information for how this program works. I have added 2 fantastic videos that wonderfully explain the program: Dr. Mercola Interviews Dr. Bredesen About ReCODE Protocol & Dr. Mark Hyman interviews Dr. Dale Bredesen. 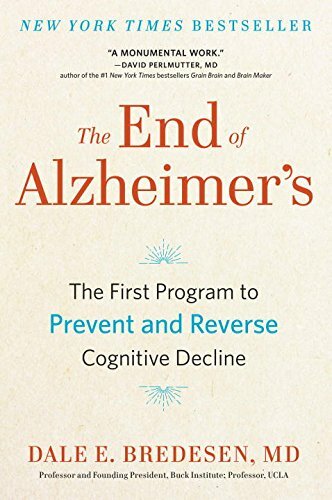 "The End of Alzheimer’s: The First Program to Prevent and Reverse Cognitive Decline"
In his book, “The End of Alzheimer’s: The First Program to Prevent and Reverse Cognitive Decline”, Dr. Bredesen challenges the pervading sense of hopelessness and helplessness that have trailed Alzheimer’s disease. He disputes the fact that there is no effective treatment or prevention method for it, providing details of his extensive and highly successful research as evidence. His position is that Alzheimer’s cannot be addressed with a single pill. Dr. Bredesen dissects Alzheimer’s disease, highlighting contributory factors- such as inflammation and toxic substances- that are responsible for the attendant cognitive decline in its surfers. He explains clearly the role each plays in putting a personal risk of Alzheimer’s. He also documents his highly opposed research journey culminating in the creation of ReCODE, an extensive treatment program for Alzheimer’s involving components such as diet, exercise, and drugs. He describes how a person can check for each contributory factor and address the same under ReCODE protocol. The book contains useful treatment procedures, which are also included as attached appendices.